Over the past few years, 24 states and more than 150 cities and counties have made it illegal to ask about a candidate’s criminal history on a job application — a trend often referred to as “ban the box” legislation. And more recently, Massachusetts was the first state to prohibit employers from asking applicants how much they were paid in previous positions, as a way to ensure pay equity. 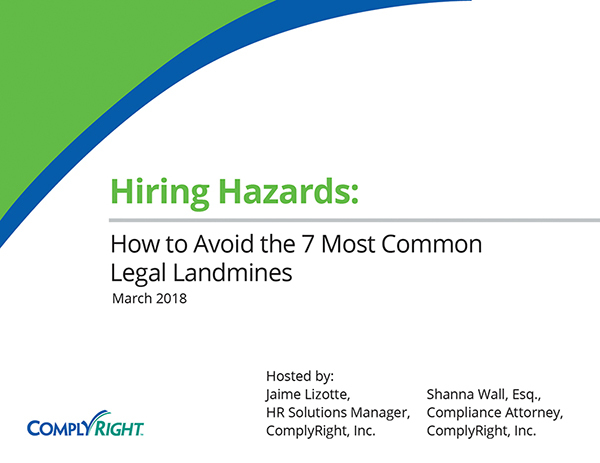 This webinar provides insight into these emerging trends in hiring-related legislation, as well as their impact on your hiring process. You’ll walk away with practical tips and solutions to help you comply while still making well-informed hiring decisions.